At Halco, we provide high-quality solar energy solutions and renewable energy options, including solar heating, to residential homeowners in our service area. Our expertise, combined with our solar powered electric systems, have helped hundreds of New York homeowners convert to a sustainable energy. Many solar companies in New York may provide solar energy services, but many don't provide the comprehensive services available at Halco. Solar electric systems are clean, reliable systems that produce electricity from the sun. Most systems meet 70-110% of their client's annual electric needs, and in addition to being an important step towards sustainability, they provide both a security against future energy prices and a good investment. Customers no longer have to worry about rising energy rates! Receive credits for any electricity you produce and send back to the utility grid! 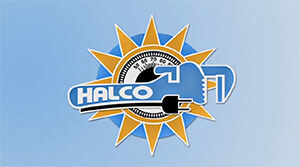 Halco offers free in-home estimates to find the solar electric system that works best for you! 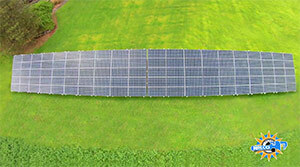 Take a look at a time-lapse video of the installation process of a ground mounted solar panel system in NY. The peak production of the system will be on average 7,894.3 kWh per year after losses due to shading, orientation, season and weather. 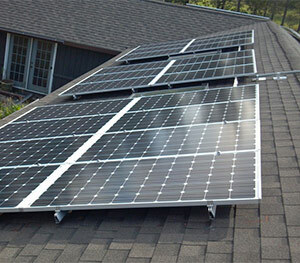 The two most common types of solar electric systems are grid-connected only systems, and grid-connected critical load battery backup systems. Both systems interconnect into your home's electrical system through a subpanel or main service panel. The electricity generated by these systems is used to meet your own home's needs first, and then any extra is fed back to the utility for full retail credit under New York's net-metering laws. Grid-connected-only systems do not operate in the event of a utility power outage. Grid-connected critical load battery back-up systems, on the other hand, allow the solar electric system to continue to work during utility outages. The purpose of these systems is to allow the solar electric system to act like a generator during grid-failure. Grid-connected critical load battery back-up systems are still grid-connected and take advantage of net-metering. Provide our staff with the last month to year of your utility bills to help determine your average electrical usage. Once we determine your current usage, we will assess possible system sizes for your home that will meet 50%, 80% or 100& of your needs. If it is determined that your home is in the upper end of usage or higher, we always recommend efficiency measures simultaneous to system design and installation. Read more about solar electric systems and how solar panels work for your home.